Comments: We are looking for STAR WARS characters to take photos and interact with guests in our lobby for peak times (5:00pm - 9:00pm) on opening weekend (Thursday, Friday, Saturday) of THE LAST JEDI. Referred by: You all have worked with us for THE FORCE AWAKENS and ROGUE ONE opening weekends and it's been a big hit with guests each time! I will be there as Old Luke, from sometime before 5 (like, 4 or earlier). My ticket is for the 6pm Fan Event, so I'll be in-theater from 5:30-ish to 9-ish on teh 14th. I then plan to troop until late that evening. I have tickets for Udvar-Hazy on the 15th, and at Cinema Arts in Fairfax on the 16th. 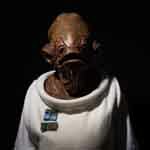 I will be there as Admiral Ackbar, from about 5:30 PM after work. I will troop for a couple of hours, and act as a handler for the rest of the time before catching a late show for the movie.